Summer project begins the Game Development School’s initiative to create augmented reality/virtual reality (AR/VR) games for those with physical disabilities. Video games are made to be fun and challenging, but few are made to be therapeutic. Now there’s Adventure Bay, an augmented reality game designed for children with cerebral palsy, that students from the School of Game Development spent their summer creating. 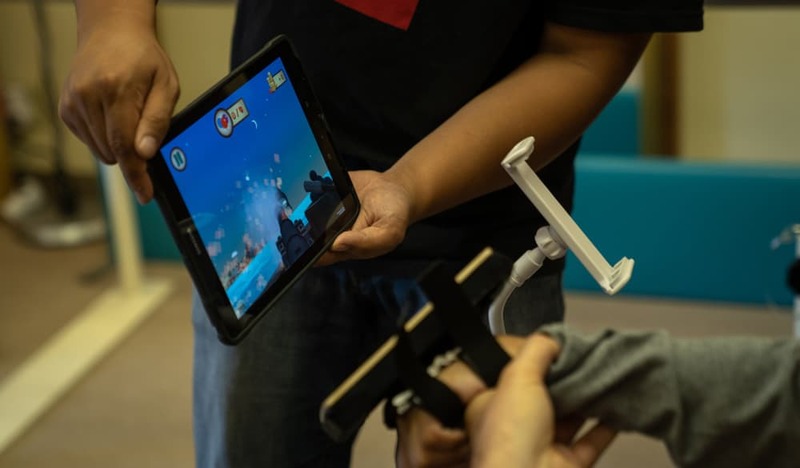 Led by Game Design Lead Steven Goodale, the team conceived of Adventure Bay as a tablet-based hub of mini-games that focus on various movement disorders and conditions associated with cerebral palsy. These symptoms often appear in early childhood, and can involve issues with sensation, vision, hearing, swallowing, and speaking. Steven Goodale (left) of the School of Game Development coaches Pedro Martinez through the Adventure Bay AR game. 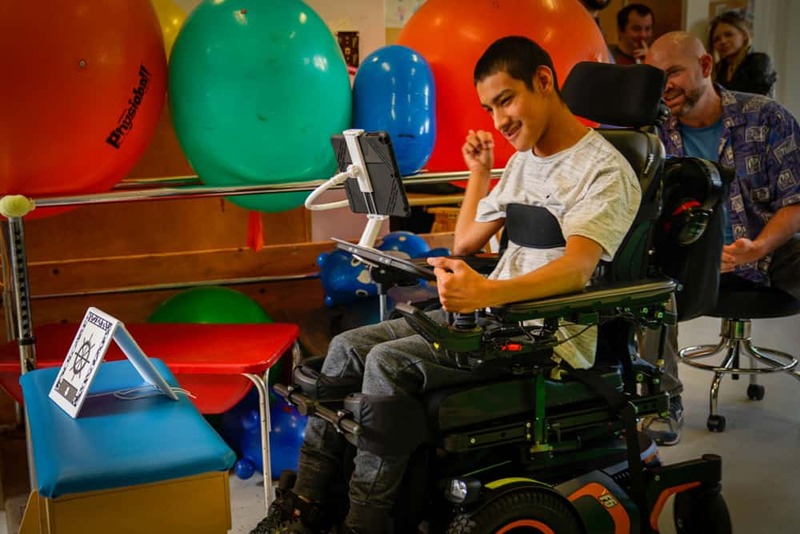 The Game Development team tested the game at facilities for children with cerebral palsy. By the end of summer, Adventure Bay included two games: “Fairy Duster” and “Balloon Shark.” Each was designed with very simple goals, guided by physical therapists from Avalon Academy, a Burlingame, Calif., private school for children with movement disorders, and California Children’s Services Medical Therapy Unit in San Francisco’s Sunset district. The advisors suggested the games be simplified to exercise gross motor movements, such as pronation and supination (the ability to rotate wrist palm up or palm down), and pilot a wheelchair. “We spent a lot of time thinking of what would be appropriate and what kind of actions these kids can take,” said Game Development student Alex Agcaoili, who worked on Adventure Bay as a designer and program lead. Martinez tested the game to help learn skills for piloting his chair. In game design, “playtests” are instrumental in pointing out where a game soars and where it needs more work. But creating games for children with cerebral palsy is especially challenging because every user is different. According to Avalon Academy’s Director of Movement Education Brenda Huey, there were occasions when games on the popular Wii platform were used to work on arm motor control and balance. But generally, she says, children and young adults with moderate to severe physical disabilities are not always represented in mainstream activities and entertainment. On a demo day held in August, 2018, Adventure Bay “visited” both institutions. Tested by five students ranging from 9 to 16 years old, Goodale said this initial cluster of patients provided a lot of good feedback on what to improve…while also allowing users to have fun trying out the games. As ambitious as the Adventure Bay therapy game project was, Agcaoili believes getting a demo into therapists’ hands and to others working in the field is a huge accomplishment by itself. 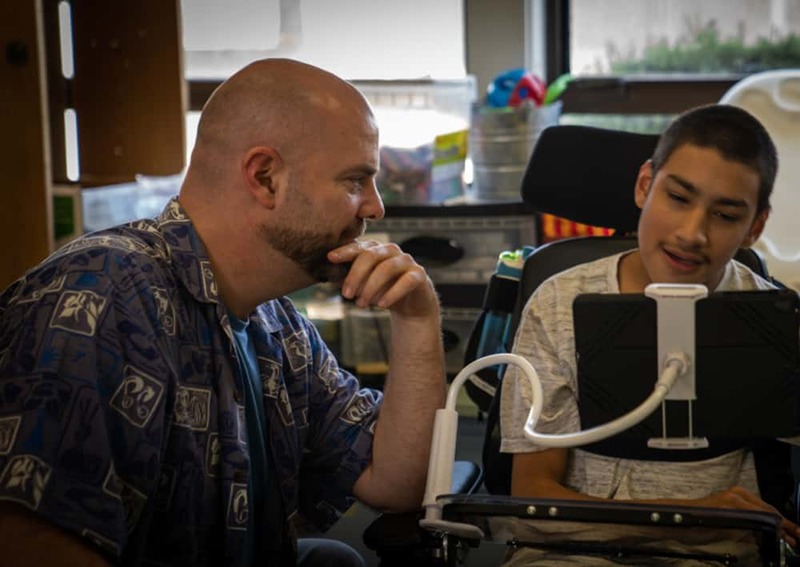 “If we get more people who can use the technology, who understand cerebral palsy, who really know the direction to go in, this project could explode,” he says. Goodale and the Adventure Bay team are setting plans to move the project forward. 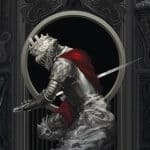 He says addressing issues within the software prototype, building out the center hub and possibly adding another mini-game are first priorities. But he’s hoping to obtain backing from more sources, internal and external, in hopes that developing therapy games becomes a regular part of the School of Game Development.